I am cheating a bit here as this week’s little “play up” was not exactly a new experience as it was one I discovered last year – stand up paddle boarding (S U P -ing). Oh if you haven’t tried it, promise me you will. It was a slightly new experience in that instead of going for a walk along the waterfront like we often do, I decided to book my friend an I a SUP experience. While she fell in twice (enjoyable to watch) I mastered texting and making calls while out on the board. I love that at my age there is actually a new sport that I want to try and can probably do till I am decrepit.If you can’t be fagged trying to surf, avoid actively working up a sweat, love being out in the water, and want to try something new then SUP -ing is the way to go. It is social, can be muscle toning and fat burning (I don’t go that fast for this to kick in) but above all else it is so liberating being out pfaffing about on the water. 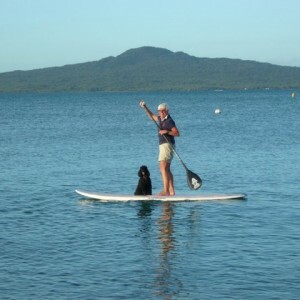 I have not yet invested in my own board because fortunately two minutes away on Auckland’s Kohimarama Beach, a great lady called Chris rents them out for $20 an hour! And I am always late getting in and she is very generous about it all. Text her in advance and she will have them ready to go on the beach . Step out of your Havaianas and jump on the board and you’ll be away laughing as you watch your friend fall in…..